Note the curl job on these animals. Wow was that time consuming. Dad bought a small farm located between State Rd 43 and Prophet's Rock Road prior to WWII and ran a few commercial Hereford cows. The first structure constructed was a block 2-car garage and this was used as housing for Bud's 4-H calves, during and after WWII until an arch roof barn was constructed in the mid-1940's. This barn was/is visible from St Rd 43 and had a Hereford Bull head pictured on N end. Now it has a Purdue Pete on N end, visible from SR 43 and I-65. Our family lived in West Lafayette and with gas and tire rationing could only come to the 'farm' once a day. Enough water was hand pumped to assure drinks for the cattle for the following day and yes, we left a jar of water to wet the leathers in the hand dug well. Dad constructed a hopper over the feed troughs that was used for morning feeding. Hand wound alarm clocks had extensions on the alarm, that when it went off in the morning, wound up a string, that through a lever, pulled a nail out of a trap door at the bottom of the hopper to drop feed in the trough. In this way they were able to provide both a morning and evening feeding. Don't have a clue what prompted this. Bud had a passion for Hereford cattle and was involved/supportive of the operation. He was manager of the Bourbon stockyards in Louisville and then the Denver stockyards. This was about the time when major stockyards were closing. He worked the remainder of his life for Wayne and Purina. He had purchased the feedmill in Maysville, Mo. roughly a year prior to his death at 49. My grandfather, uncle and brother all died of heart attacks at age 49. When I turned 48 I had a heart examination and bought more life insurance. My genes were lined up differently. Bud was an active Christian as was my Mom. Dad was active in a local church and accepted Christ as his savior prior to his death, Amen. Dad attended a one room school (the Hunt school) in Gibson Co. Indiana. He received a PhD in chemistry prior to his 22nd birthday. He accepted a job at MIT, in the east. Both Mom and he were homesick for Indiana and he applied for and was hired at Purdue. I saw his first year’s contract and it was for $1700 (I recall). His last contract in the 1980's was for $22,000 (maybe). I saw the bill for my sister's birth, hospital (13 days) and doctor combined $65, early 1930's. He worked on the heavy water aspect of the Atom Bomb during WWII. Didn't mean anything to me but I recall the FBI visiting our house. After the War, former graduate students mentioned that he was involved with solid rocket propulsion. I did NOT connect with chemistry. Failing chemistry is NOT an option and most of you are going to earn A's because you're going to learn chemistry. Those who think they will not learn chemistry, will painfully be convinced otherwise. Dad was NOT politically correct, by any stretch of imagination. I do not know what the opposite of PC is, but that was Dad. I still have Dad's chemistry students stop and reminisce when they see our Hunt Bros. sign at cattle shows. I loved my Dad and Mom. The slide rule was still in use when Dad retired and I've heard stories about that from his former students. Dad, Bud and I are Hunt Bros.
We began showing at the International in Chicago in the 1940's, won a bull class there last year the show was in Chicago and showed the first year this show was moved to Louisville. 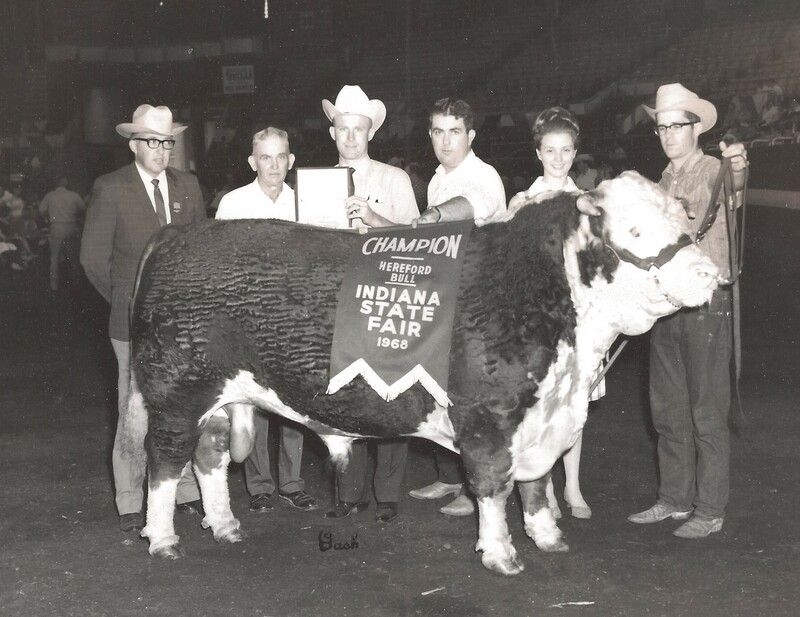 Exhibited the Grand Champion Bull there in 1994. When son Travis was in the junior program, we showed in 17 states (I think). How times change, don't believe we stayed in a motel during this time. Sometimes the trailer was too hot, too cold, too wet, too snowy. Ask Don. Do not have pictures or notes about a lot of this, so it was a revelation when daughter unearthed these pics. Thanks Tiff. Call me at 765/418-0651 if you know the unidentified girl in these pictures. If you're going to be in central Indiana, give us a shout, we'd love to have you stop. Battle Ground is located approximately 1 hour north of Indianapolis or 10 miles northeast of Lafayette, In. Battle Ground is a historic site where the last major Indian battle in the Northwest Territory occurred. The forces of the Indian brothers Tecumseh and The Prophet were defeated by Wm. Henry Harrison and his troops in 1811. Battle Ground does not have any stoplights, but there is a conscientious town marshal. For any 'mature' visitors...we are located across the road from where the VanNatta Hereford Ranch was located. 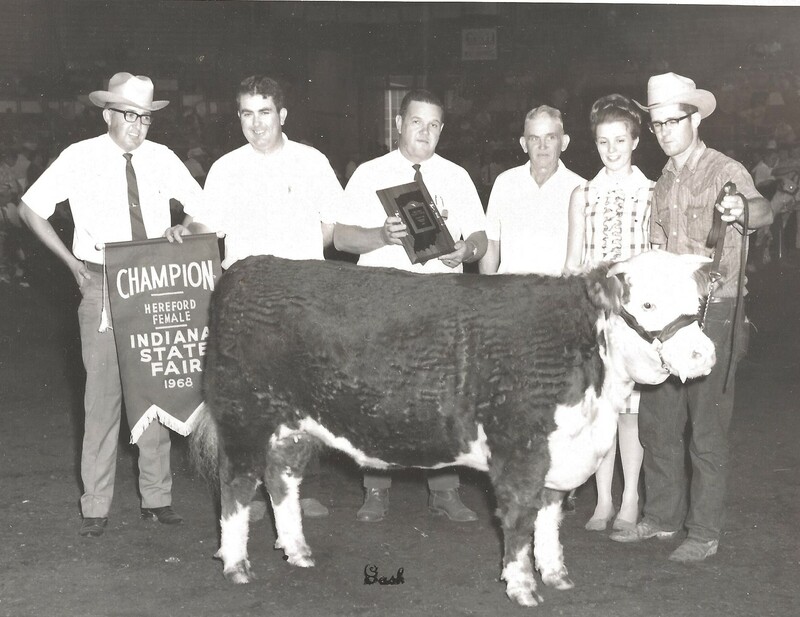 Jack VanNatta was a AHA president and called on to judge Herefords nationally and internationally. In the first half of the 1900's VanNatta's showed Herefords nation-wide. Jack was instrumental in getting us started in the Hereford business in the 1940's. The VanNatta show barn was torn down about 5 years ago and is now a corn field. One of the main pastures is now a country club golf course. Progress? P.S. Made this goal: we had two bull calves in Denver, January 2011. Thanks to Rusty Miller Family and Bruce Thomas Family for helping make this possible!! Will take a look at the 2061 show as this date gets closer.